Where should I backup my files and folders to ? You should backup your files/folders to a location other than your C drive in case of a hard drive crash. You can choose any other hard drive or network drive that you have access to, a CD drive, or any other media if available. Can Backup Wolf backup across network drives ? Yes, simply select the network drive in Backup Wolf when creating your backup profile. Can Backup Wolf back up to CD's ? Yes, but you need to have packet writing direct access software installed to allow Backup Wolf to write directly to your CD drive. An example of direct access software is Roxio's DirectCD. Most CD-RW drives include this type of software. Does backup Wolf compress the backed up files ? No, Backup Wolf creates a "mirror image" without any compression algorithms being used. This allows you to easily recover your data manually if necessary from the backup location. Backup Wolf includes a Restore option, but if this for any reason fails you then have the option of manually copying the saved data back to it's original location. How do I get upgrades ? Backup Wolf includes an "auto update" menu option that checks for availability of any new versions of the software and automatically downloads the update. What happens if I lose my backup profile data files ? This is another advantage of Backup Wolf's mirror image and non compression design which allows you to easily recover your backed up data by simply Copying and Pasting the files and folders back to their original locations from the backup location if necessary. Does an Incremental backup also backup new files in the folder that's selected for a backup? Yes! Backup Wolf's incremental backup option checks each and every file in every folder and sub folder selected in the backup profile that you create, and then compares the file date and file size from the file in the *Source* location to the file in the *Target* location and then only updates each file if it's changed. Backup Wolf also looks for any new files and backs the new files up to the *Target* location. Any sub folders in the folder that you have selected in the backup profile are searched and updated automatically. The incremental option is often stunningly fast for maintaining your backup's since it only copies files that have changed or new files to the *Target* location. What should I do to maintain previous backups ? Simply use Backup Wolf's Incremental backup option and you will never have to worry about your data! What if my hard drive crashes ? Can I still restore the data from the backup ? Yes! You can recover the data using Backup Wolf's Restore option which will copy the data back to it's *Source* (original) location from the *Target* (backup) location that you specified in your backup profile. If all else fails, you can also do it manually by simply copying and pasting the uncompressed backup data back to the *Source* location very easily. Why should I use Backup Wolf ? The most important files on your computer are often your document and data files for many of the software programs that you use every day. Backup Wolf allows you to easily target these files and folders and back them up to a safe location so that you can feel secure in the event of a problem. Maintaining your backups often only takes seconds using Backup Wolf's Incremental backup option. We at Lone Wolf Software only use Backup Wolf to maintain our critical data and we have never suffered a data loss! Backup Software that solves the "Backup Procrastination Syndrome". Designed for Home or Business. 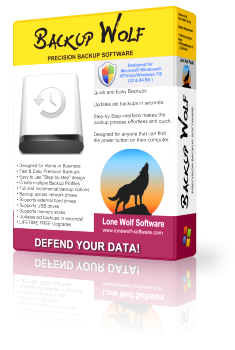 Backup Wolf (TM) Backup Software is a Trademark of Lone Wolf Software. All Rights Reserved. Backup Wolf is licensed as Shareware and distributed as backup software, back up software, recovery software. Copyright © 2019 Lone Wolf Software, All rights reserved.